Beers – Nicaragua Craft Beer Co.
All beers on tap at the Cervecería are made by hand with our 3bbl brewing system in San Juan del Sur. Using traditional brewing methods and the careful selection of fine ingredients, we strive to create deep, nuanced flavors and aromas with every batch. We are lucky to live in a region that produces an abundance of unique and tasty ingredients that can create some very interesting beer making opportunities. We try to make beers that fit the San Juan del Sur beach lifestyle: beers that taste heavenly after a day on the water. Unfiltered, golden, crisp, and refreshing -- a taste of Nicaragua in every sip. 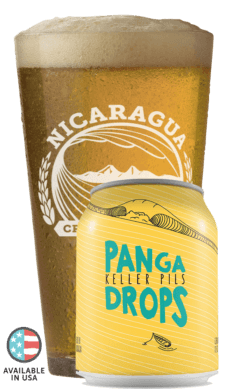 Say 'Hola' to the perfect craft pilsner for the beach. This cloudy, straw colored wit beer has a fruity nose, a soft ginger palate, and a slightly tart, dry finish. Brewed with local wheat berries and a healthy dose of fresh ginger in the kettle. Named after the famous Native tribe that controlled the Isthmus of Rivas before Spanish colonization. Deep copper colored ale with biscuit-like toasted malt flavor and a smooth, dry finish. This light-bodied golden pale ale features a floral aroma, and a dry citrus finish. Perfect refreshment for a day on the water, or after a surf watching the sun set. This golden pale ale has a nose of bright passion fruit and green tea. It has a medium to light body and a dry malt finish; it's clean and well-balanced with a slight hop bitterness. Named after Nicaragua's most famous reef break. Features a medium body, creamy mouthfeel and complex finish. Big roast flavors of coffee and chocolate balance the 7-year Flor De Cana rum providing a smooth, yet full flavor profile. Brewed in collaboration with Melvin Brewing in Alpine, Wyoming. Deep golden in color with a medium body. Zesty citrus aroma with a resinous yet smooth hop profile, featuring notes of tropical fruits. This full-bodied Porter has a nose of sweet chocolate, balancing a smooth malty backbone with crisp dry bitterness. 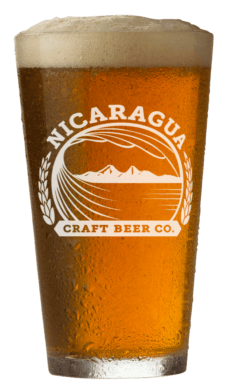 Brewed with Nicaraguan coffee and coconuts. Served on nitro to give it an extra creamy head. Dark, roasty chocolate malts, brewed with shade-grown Nicaraguan coffee. Served with nitro, giving it an extra creamy head. This medium-bodied amber IPA has a nose of dried apricot, a body of tropical fruit, and a dry finish with a suitable grapefruit bite. Named after the heaviest beach break in the country, El Boom is brewed for hop-heads...not for the faint of heart. This hazy blonde ale has been fermented with ripe local mangos, and has a fragrant and light bodied nose with a hoppy finish. Rose-colored tart wit beer with a light body and tart finish. Brewed with local hibiscus. Brewed with wheat, Noble hop varieties and a heavy late addition of Citra, Simcoe and Amarillo. This beer is invigorating and floral, with spicy citrus notes. A bright, golden lager brewed with Noble hops; it’s smooth and malty with a crisp finish. This burnt amber colored ale features a hint of chocolate, a complex malt driven body with notes of coffee, caramel and chocolate, balanced by a crisp hop finish. Brewed with local cocoa nibs, coffee and Flor de Caña rum. Named after the coastal dirt road. This hazy blonde ale is the perfect thirst quencher for the hottest days in the dry season. Light hop character and a super dry, crisp finish. This kettle sour has been fermented with fresh, local dragon fruit.